Today another year older, but happier and wiser than ever! I have received well wishes from my Clay who gave me the most beautiful card (also some speakers for my computer) we always try to outdo each other when we share cards! On our 22nd Wedding Anniversary we picked out the same card for each other – we really had a laugh on that one. Have received birthday wishes from Kay and Susan (cousins), Jaydee (Amazon gift certificate – thank you so much), my friend Bonnie and wishes from my older step son Ricky (who will call me later this evening) my younger stepson George will call later today. 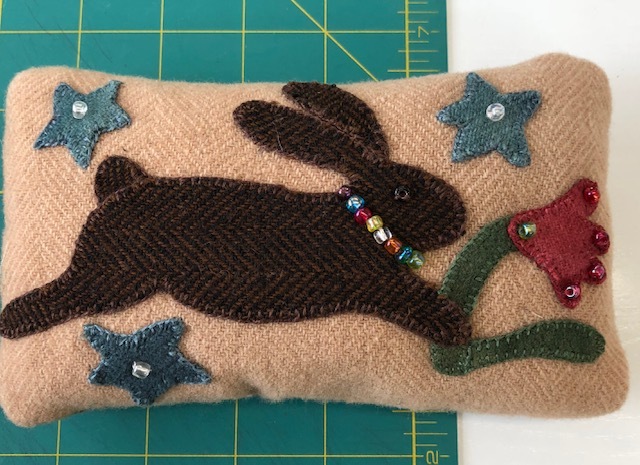 My friend Cathy sent me a pin cushion that she made (Rabbit this year) and one last year(Remember Me) that I forgot to showcase! She is so talented and such a dear friend! Cathy always sends Clay and I a card on special holidays and we so enjoy them. 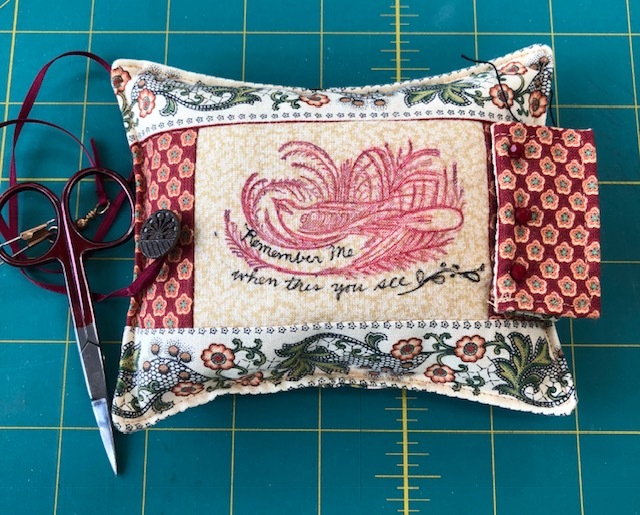 Cathy’s Pin Cushion – Absolutely Beautiful! Love this Bunny Rabbit – This is my Birthday Present from Cathy this year! Then the biggest surprise that came today from Lori. 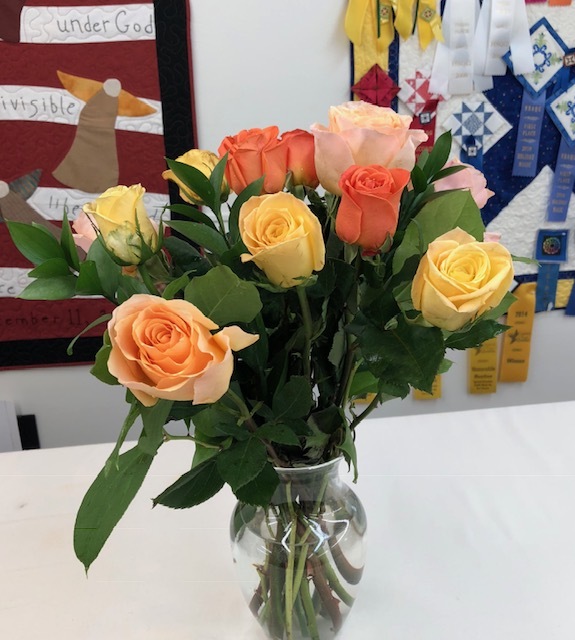 Thank you so much Lori for the beautiful flowers! 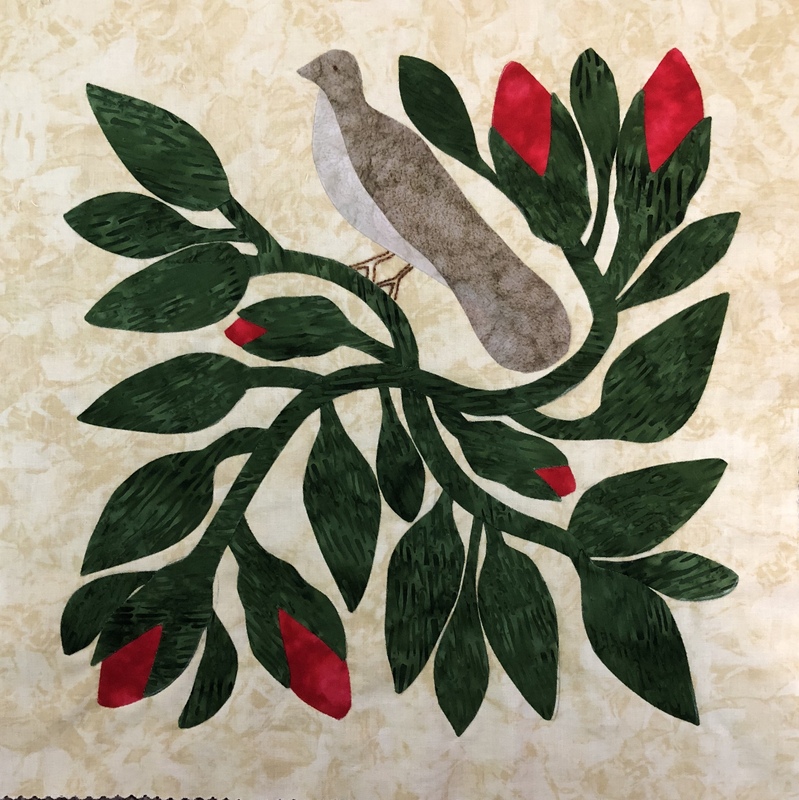 I have so much to be thankful for, especially my great quilting buddies, Jaydee, Jan, Gretchen, Cathy and Lori who listen to me when I am on a roll, or rolling down the hill! Great friends and great Step-sons who love me who would be with me if I needed them! I am extremely blessed with my Clay – we would both be lost without the other – we were so blessed to have God put us together. Someday I may post that happening. We grew up together on the same street, attended the same school, never dated, and he located me when I lived in the Washington DC/Northern Virginia area on 3 June 1996! Married on 2 August 1996 and again in our church on 1 September 1996 – The 3-2-1 Courtship! We retired in March/April 1999 and have not been apart since. Lots of good memories and lots of sad memories, but through them all we are still together!!! I have had a great Halloween Birthday this year! To add to the “happy”, we are leaving for a 2 week trip to Sierra Vista, Arizona soon. We have not been there since we sold our RV in 2016. This time it is “hotel” time! 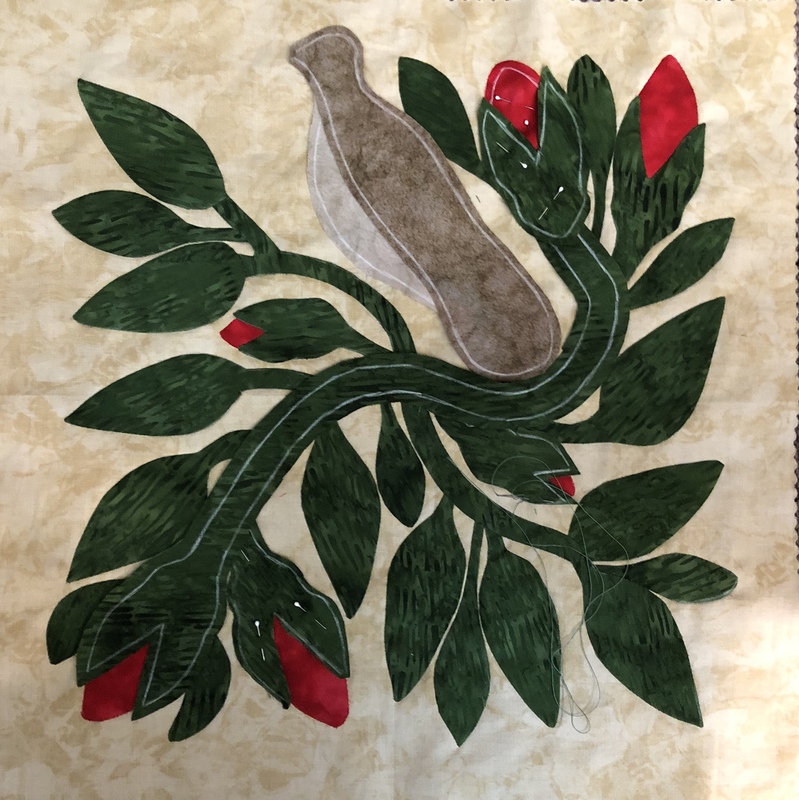 We are both anxious to get back to Arizona and visit our friends and play Touristo in Tombstone, Bisbee, Tucson, and of course all the quilt stores that I used to frequent in the area! 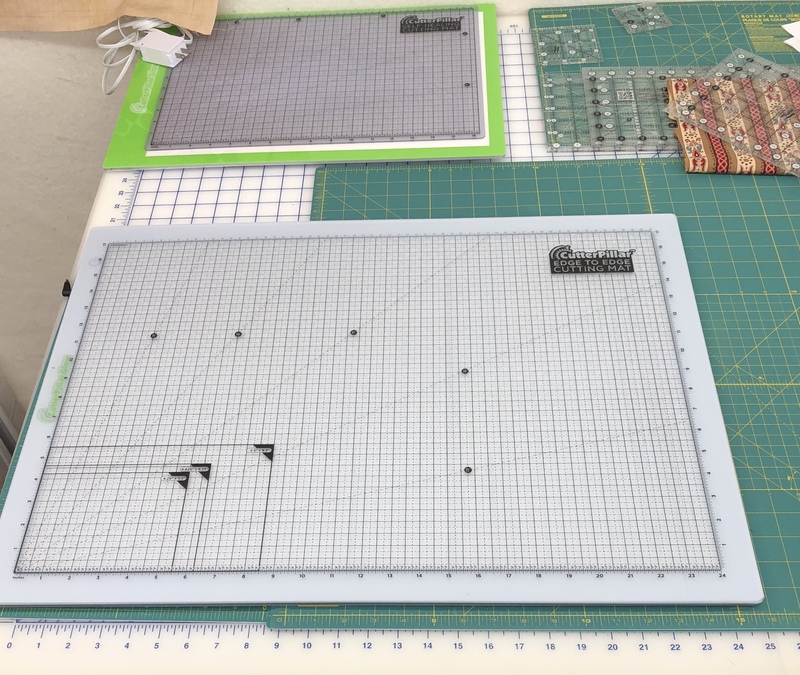 HQAL and Slow Stitching Sunday! A Happy Sunday and pre Halloween to all! I was born two minutes to midnight on Halloween so everyone celebrates my birthday! When I was younger and the weather pattern was different, I always knew what my birthday present would be – a new winter coat! In South Texas our weather pattern used to provide a wonderful cool front on my Birthday and I loved the break in the warm South Texas summers. SO this year I am getting a great present from Mother Nature – a Cold Front – YEA! Looking forward to it! I have been working on the corners for Brinton Hall. When I last worked on it (think in 2016) this is where I left the center medallion. 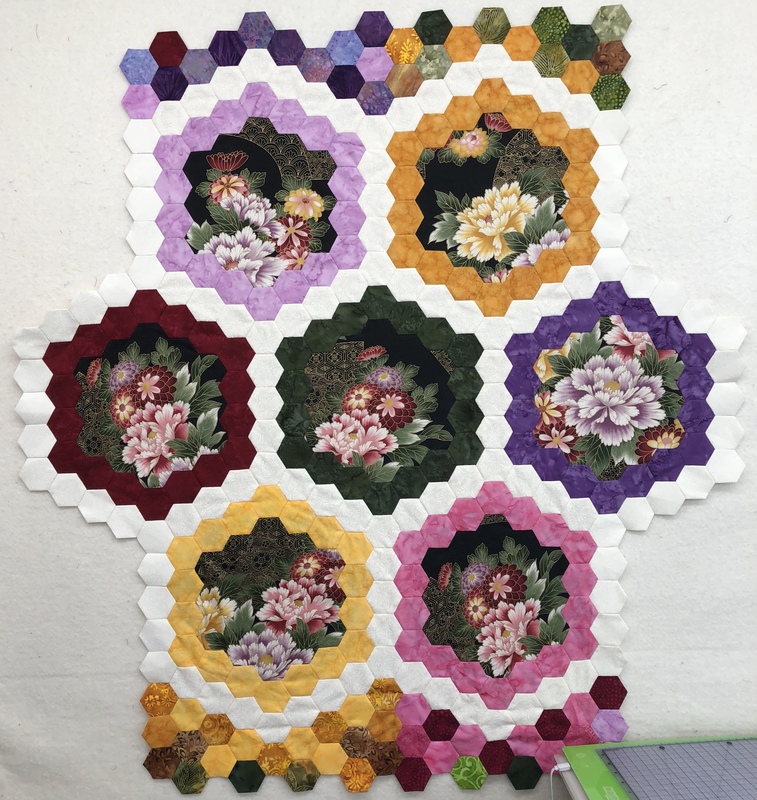 There are 4 hexagon sections that I am currently working on to complete the Medallion. I was pleasantly surprised to see that I have already completed the top and bottom middle portions. After looking at it I see that on the Upper Top Left area are missing a couple of hexagons. These will be added later. This is the lower right section. I have 2 rows sewn together and will finish the other 3 this afternoon. This is the Upper Left Section that I will also be working on this afternoon. How did we ever do without our cameras in our phone? 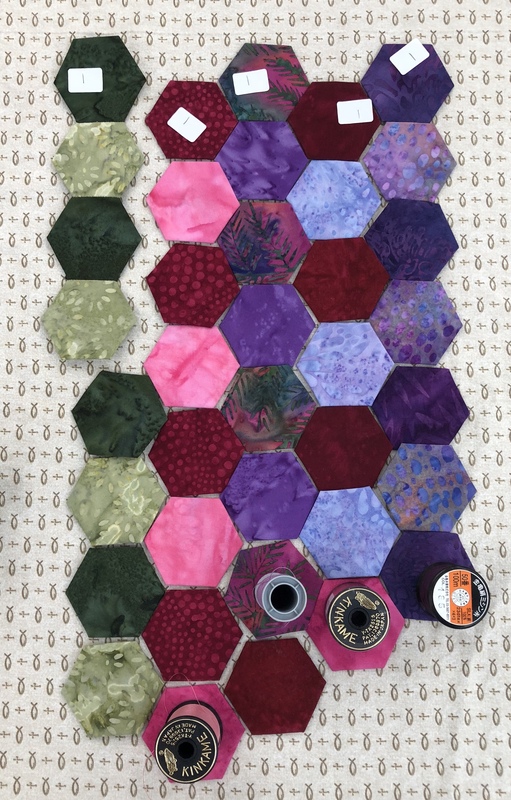 I took pictures when I started this quilt, and when I prepared all the Hexagons I put it on the design board and took pictures of each section and labeled each row and Section in separate baggies. 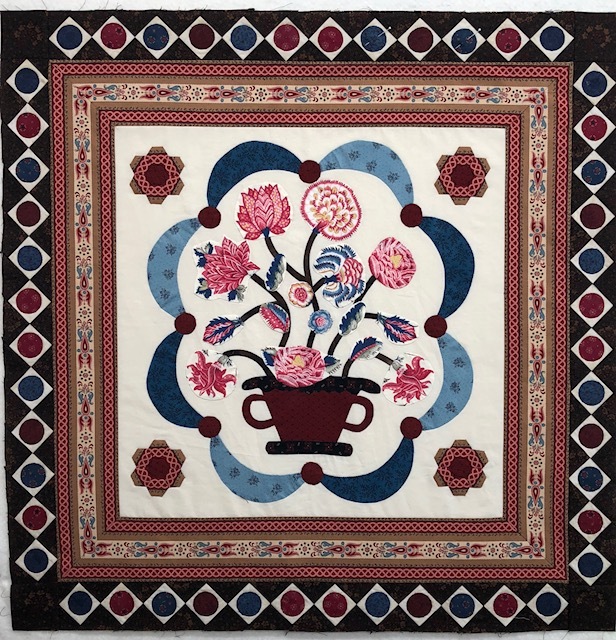 I was so glad that I took the time to be organized on this part of the quilt because it has made it so much easier to come back to the project without a lot of issues to work out. Of course the quilter made a boo boo on the first Section and had to tear those tiny tiny stitches out and redo. 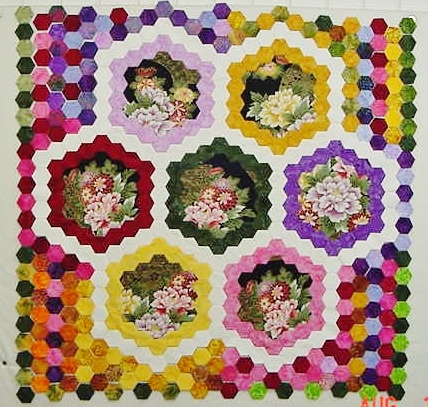 But it is still going to be a fun quilt to make! I have been working on Block 8 of A Bountiful LIfe. 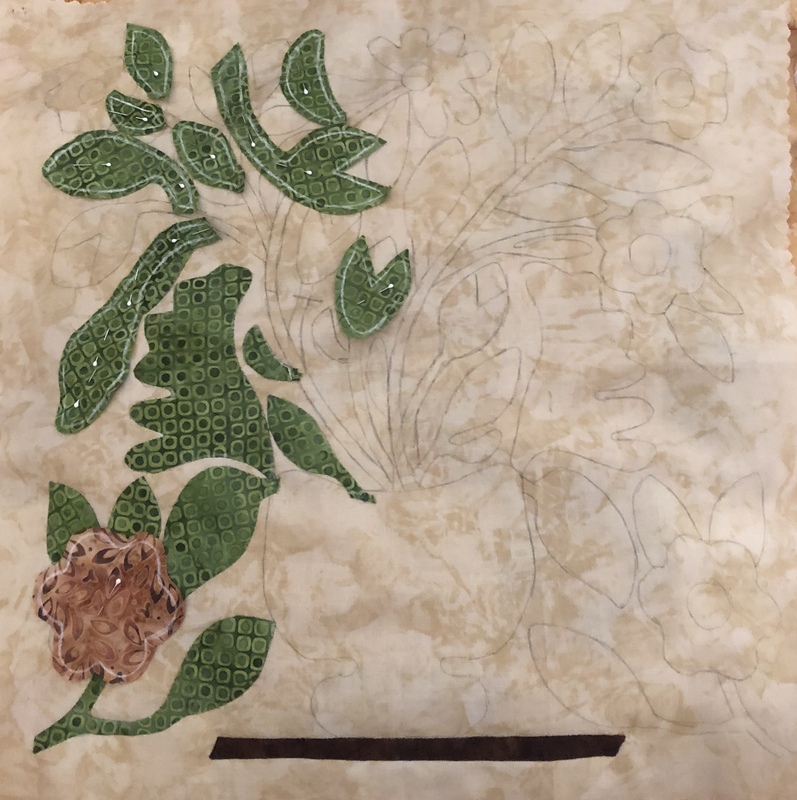 It is coming along, but not fast enough for me! I need to really start scheduling my time better. I finished Block 7 last week. 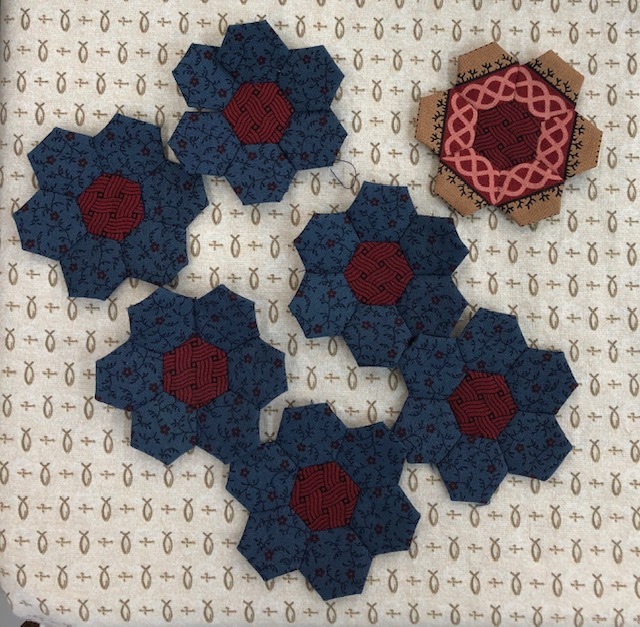 I have finished preparing all the hexagon flowers for Mountmellick and have 5 blue flowers completed, but they are so small (1/2” hexagons) I had to take a break from them! I am doing very well on my food list! By eliminating all chocolate and potato chips and any other carbs a lot of the diabetic symptoms have gone away – profuse sweating and restless sleep are no more! Although I have found that I still have to have a potato each morning, or I have issues with potassium! I was losing energy and brain power this week and finally figured it out! I am much better now and will leave the potato in my diet eating it at breakfast only! My walking is back on track and the walk is so much more enjoyable with the cooler weather! I have lost almost 10 pounds since 4 October. I think the last 10 will take another month to lose. I wanted to be at a certain weight by Halloween, but may miss it by 2 or 3 pounds! We will see! Checking Out of York Lodge! It is a finish – I finished the border this afternoon on York Lodge. 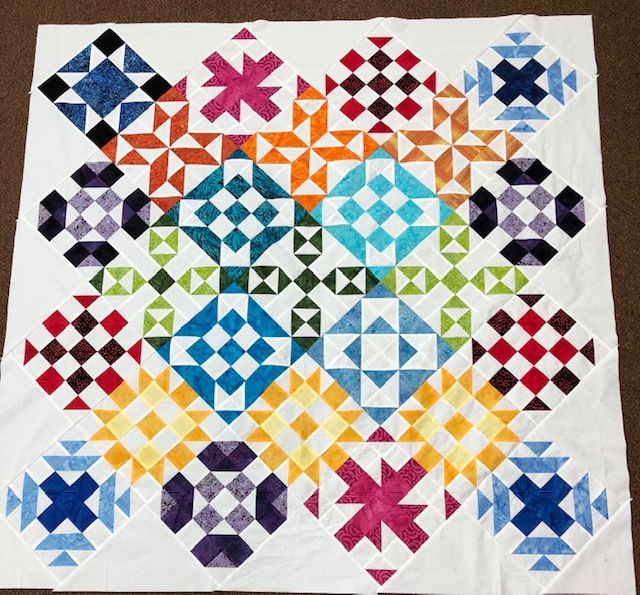 This quilt was a monumental task and a great challenge for me. There were good days and bad days, but in the end it has been worth it. I hope everyone likes it as much as I do. Here is another view of York Lodge. It measures 83 x 99, a lot bigger than I expected. But those Stars really float! I am having one of the best weeks in many years – pays to quit eating carbs! Have a great week-end! Greetings from South Texas where it is 51, overcast, a light mist in the air, and cold! – Finally. This is my kind of weather and so much more palatable for my 30 minute walk in the mornings. Today is a day where one just would like to coil up in the recliner and read a book, but I am on a mission, so not time to relax now. 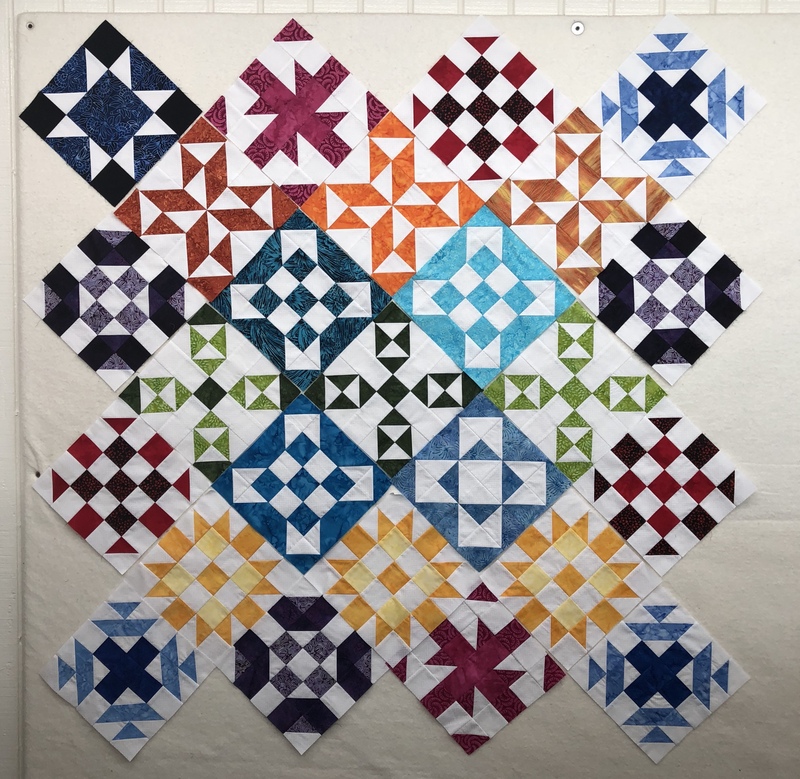 I am ‘almost’ finished with RSC 2018 Sampler. 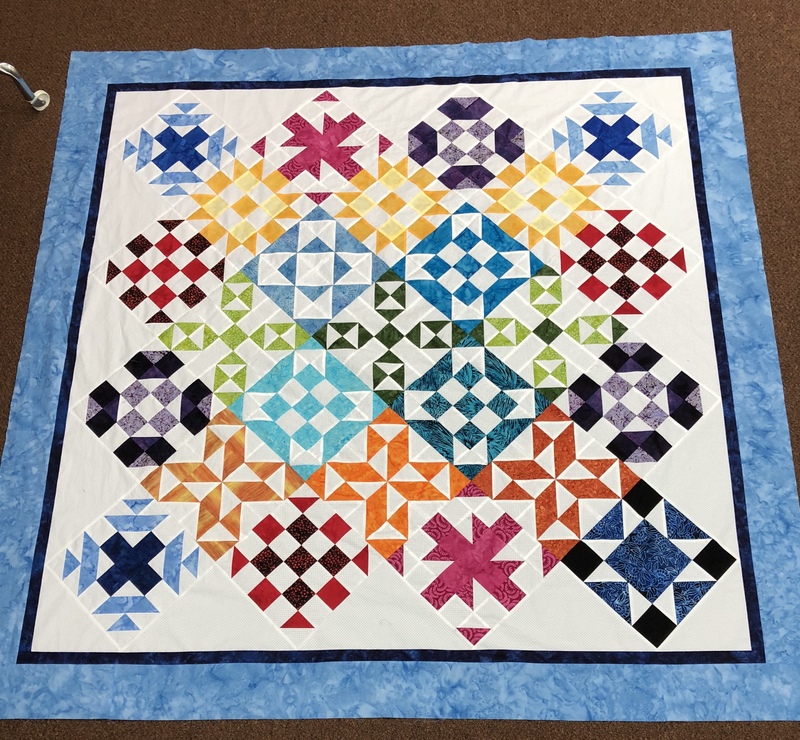 I finished the setting triangles yesterday, but made a boo boo (Gretchen warned me) and turned the center strip the wrong way! Darn! It was ripping time last night. This morning I fixed that and ordered more of the fabric for the borders. I always purchase my batiks from Web Fabrics in Virginia. I have traded with Carly since 2004! I belong to the 100 Club which provides me a 10% discount on all purchases! Cannot beat that! She has a booming on line business now and a store in Purcellville, VA. 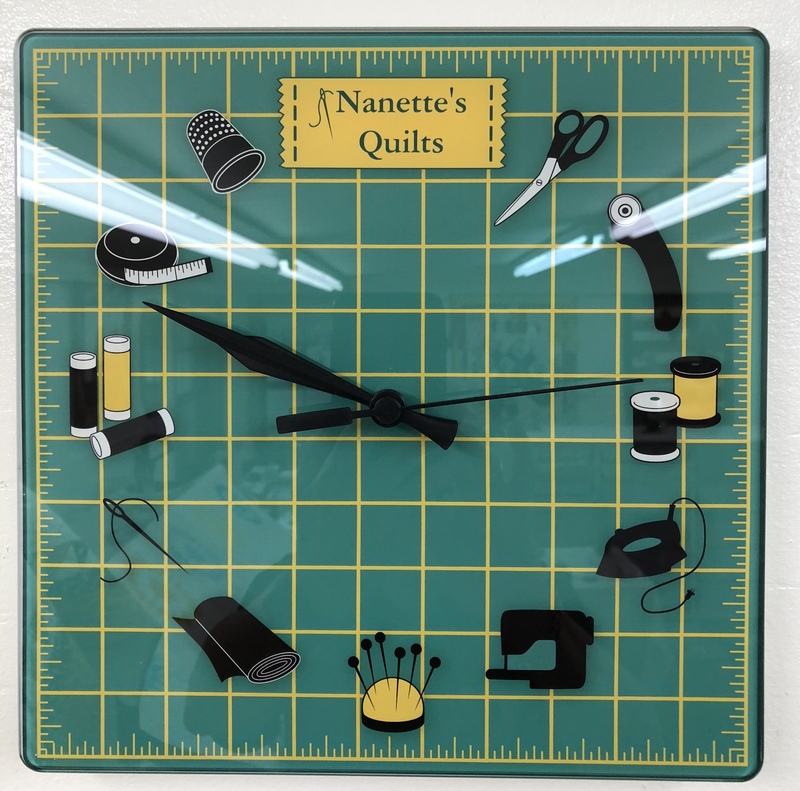 It is a wonderful Quilt Shop to deal with. 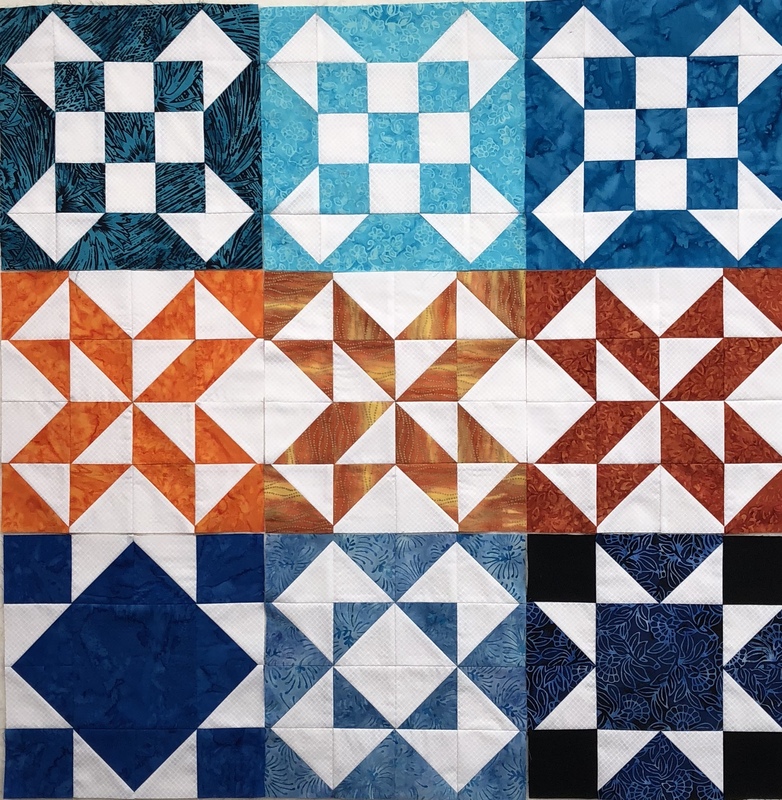 I will have a 1 inch dark blue border to frame the quilt and then a 4 inch light blue border to complete it. I am so excited to have this one completed on time. Now on to cutting the border for York Lodge! 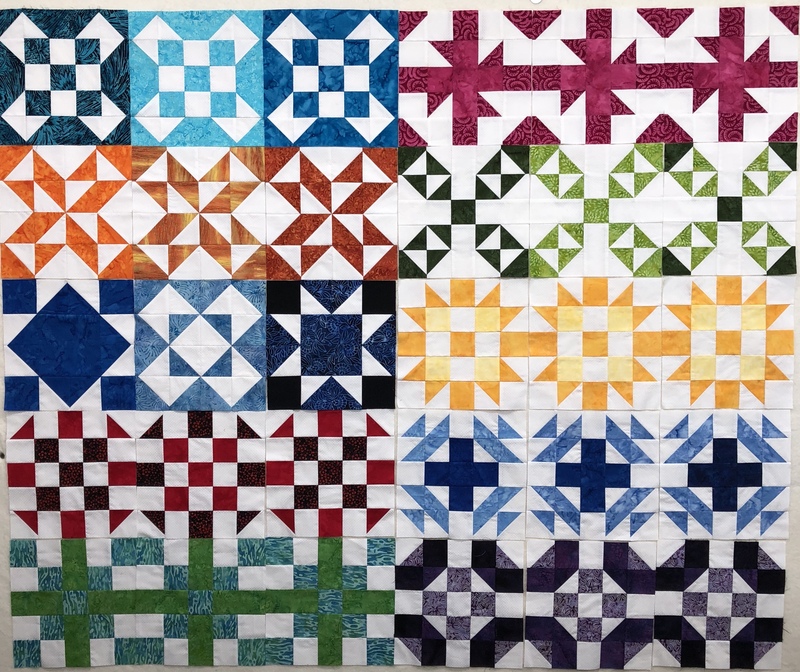 York is going to be a large quilt as the measurements are currently 73″ x 88″ and I will be adding 10 inches in borders. Have a wonderful week and I am hoping that this cool weather continues for the rest of the week and that we do not go back to the 90’s until next summer! Well, I did get the blocks on the design wall and here is my first cut at setting it on point. I have 5 blocks left over, but they are ones that were not my favorites. Trying to decide on sashings. Always good to get a start on what looks good together. This is more of a planned scrappy. 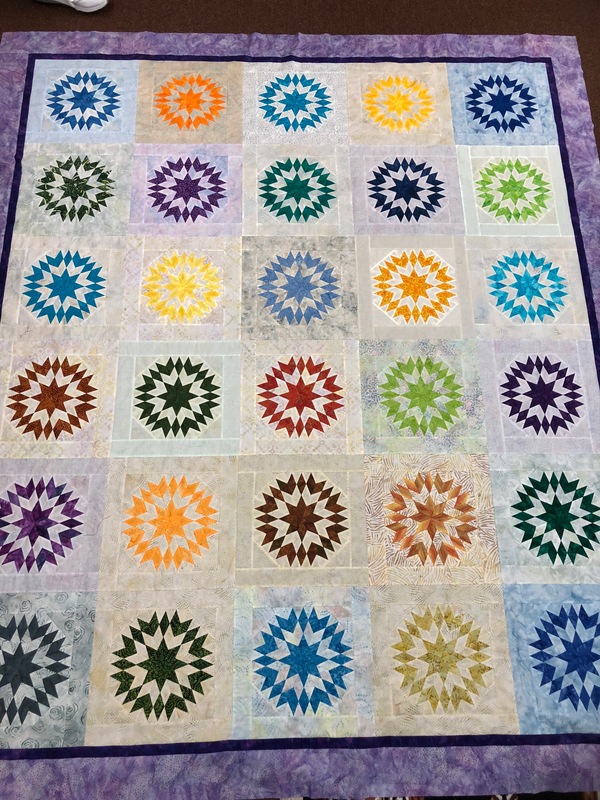 Of course I did not plan anything on this top – just made 3 each 10” blocks each month! 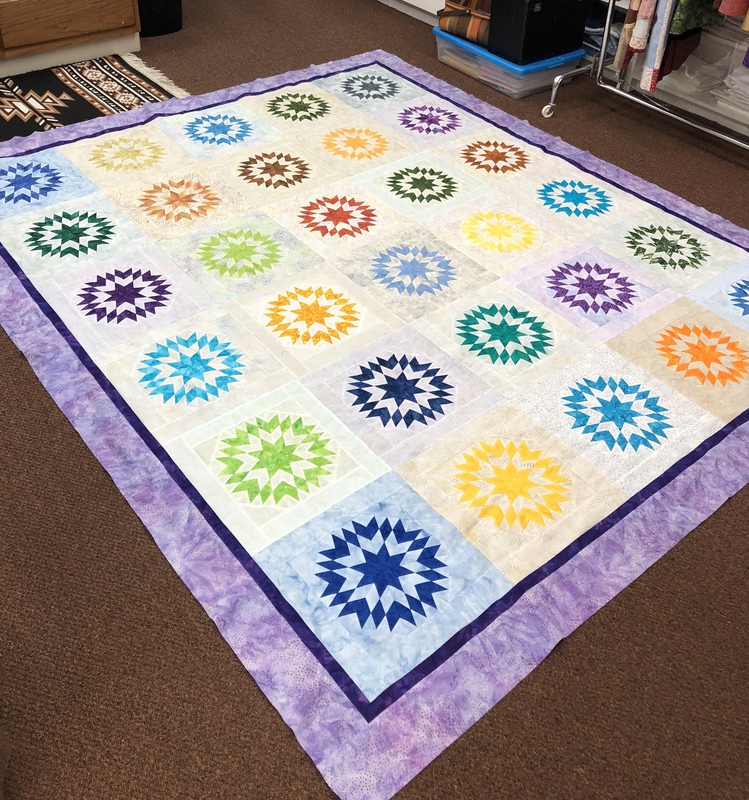 So neat to have a quilt made without stress!